Which Type of Smog Check Do I Need? - SmogTips.com. Learn about Regular Smog Test, STAR Smog Test, and STAR Smog Check Repairs. The California DMV requires vehicles undergo one of two different smog check types based randomly or determined by a vehicle's specific smog check history. Your DMV registration documents will mention either, Smog Certification Required, in which case you can visit any smog station, or Smog Certification Required at a STAR station, in which case your vehicle will need to be inspected at a STAR Test Only station or STAR Test & Repair station. If you do not have DMV paperwork and are not sure of the type of smog check your car, truck, van, SUV, or motorhome needs please call the California DMV at (800)777-0133 to inquire. Older vehicles typically need STAR smog checks, where newer models are allowed to obtain a smog test at any smog station. See sample (A) below: Locate the smog check requirement section on your DMV paperwork. If the DMV only mentions Smog Certification Required, you may take your vehicle to any Smog Check station. So long as there is no mention of STAR, your vehicle is considered to require a "regular" smog check and it can be tested at any smog station which performs smog inspections. All smog test stations in California can perform "regular" smog checks. A "regular" smog check is all that is required when obtaining a smog check for initial California registration, or when buying or selling a vehicle in California three months prior to the vehicle's registration expiration date. See sample (B) below: If your DMV paperwork mentions Smog Certification Required at a STAR station, your vehicle must be inspected at one of these stations. Some STAR stations are only authorized to perform smog inspections. These stations are known as STAR Test Only stations. 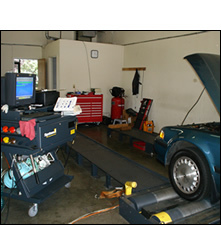 Other STAR certified smog centers can perform smog inspections as well as smog check repairs. These smog stations are known as STAR Test & Repair stations. Both STAR stations are allowed to perform regular and STAR smog checks. If the DMV is asking for "Smog Certificate Required at a STAR station" you can visit either of these smog test centers. What if my car needs smog check repairs? If your vehicle has failed the smog check, the Bureau of Automotive Repairs requires that only the vehicle's owner, a STAR Test & Repair, a regular Test & Repair station, or a Smog Repair Only station perform diagnosis and/or repairs. General auto mechanics, unless smog check certified, are not allowed to perform smog check repairs. The State of California will not reimburse CAP applicants monies spent on smog check repairs at auto repair centers which are not smog check certified. If your vehicle fails at a regular Test Only smog test center or STAR Smog Test Only station, you will need to seek repairs at a smog check & repair center or STAR Test & Repair station. STAR Test & Repair stations are allowed to perform Test Only inspections as well as smog check repairs. All STAR certified stations are monitored by the Bureau of Automotive Repair on a trimester basis and held to the highest smog check standards. STAR stations are participants in the Bureau of Automotive Repairs CAP program. Test & Repair Station - "Test and Repair" stations are authorized by the State of California to perform "regular" smog inspections, as well as diagnose and repair vehicles which have failed the smog check. Test & Repair smog stations can not certify vehicles requiring STAR smog checks. Test Only Center - Smog test only centers are authorized by the State of California to perform all "regular" smog inspections. They are not allowed to perform any smog repairs. The Test Only center's main obligation is to perform a non-bias and accurate smog inspection. Test Only smog stations can not certify vehicles requiring STAR smog checks. STAR Test & Repair stations may also perform smog repairs on vehicles participating in the Consumer Assistance Program. CAP Stations maintain high standards of operation. Repair Only Station - "Repair Only" stations are authorized by the State of California to only diagnose and repair vehicles which have failed the smog check. Repair Only smog stations can not inspect or certify any vehicle.